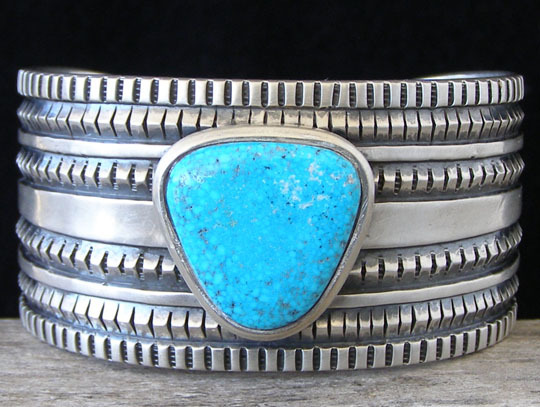 Harrison Jim Kingman Turquoise Sterling Ingot Bracelet size 6 5/8"
Set with a soft-cornered triangle of natural, untreated Kingman turquoise, this bracelet is a fine sample of precise cold chisel work used to decorate the cuff. The stone is set in a very wide, straight-edged bezel which lends additional depth to this piece. This bracelet has a lightly brushed finish and an oxidizing agent was used to make the stamp and chisel work darker in the textured recesses. The cuff tapers slightly to its softly rounded terminals. Stone: top to bottom point 7/8"; widest width 7/8"
Width of cuff at center stone: 1 3/8"